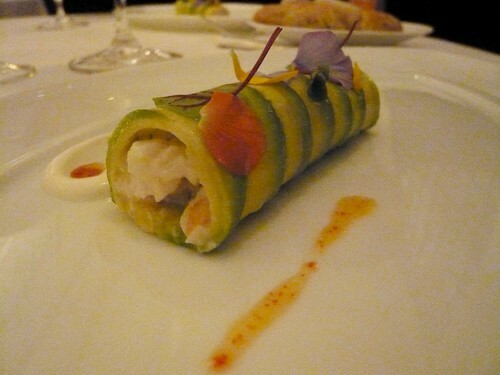 La Cachette was a long-standing restaurant in Century City, where chef/owner Jean Francois Meteigner served California-influenced French dishes for fifteen years. Now the restaurant has found a new home as La Cachette Bistro on Ocean Avenue, where you can take in the ocean breeze on the patio. They wanted to promote their lunch prix fixe deal, so they invited me over for lunch. It was impossible for me to make it there during the weekday, however, so I ended up coming in for a Saturday brunch instead. The lunch prix fixe on Monday-Friday gets you Soup of the Day or House Salad, One of Three Entree Choices, and Dessert of The Day for just $15. Pretty good deal, no? 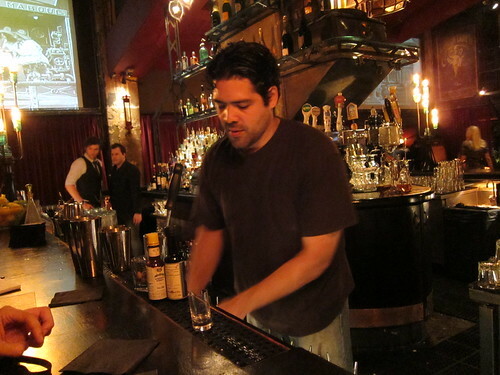 Soon after we were seated, Marc Danays, the bartender came over to greet us and offered some libations. I had brought 0ne of my roommates with me. She's originally from Cambridge and she and Marc noted their common accent and the two of them hit it off immediately (Marc worked at major clubs in London). 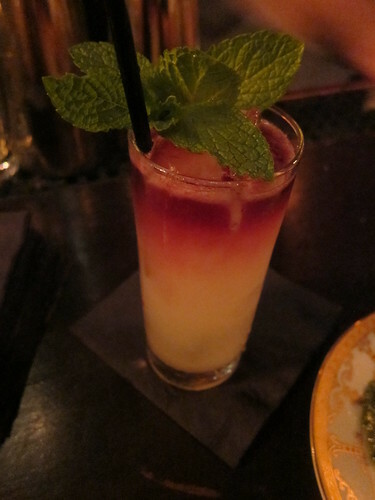 "Bubbly Love" (gin, lime, pomegranate liqueur, topped with champagne) for me. "Deep South" (rum, OJ) for my roommate (who told him she liked rum lots and lots). 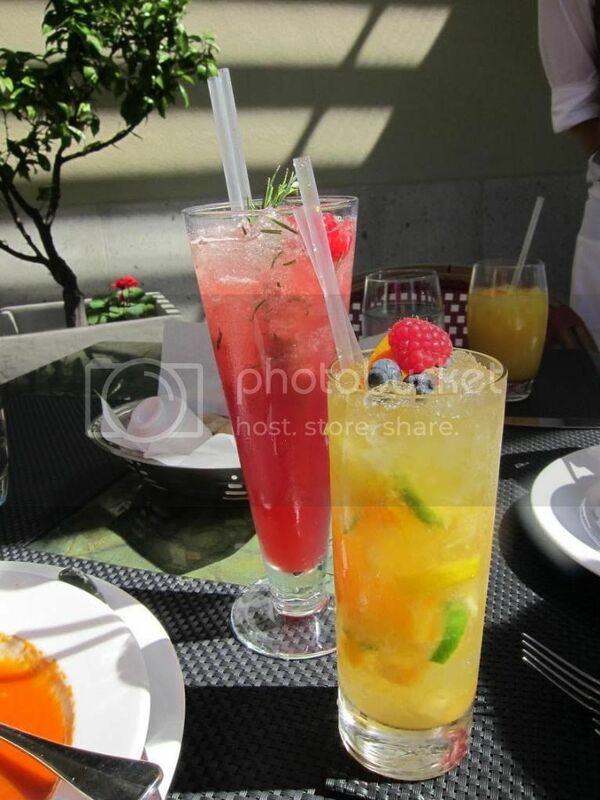 Both drinks were sweet and refreshing, but I ended up liking my roommate's drink more. 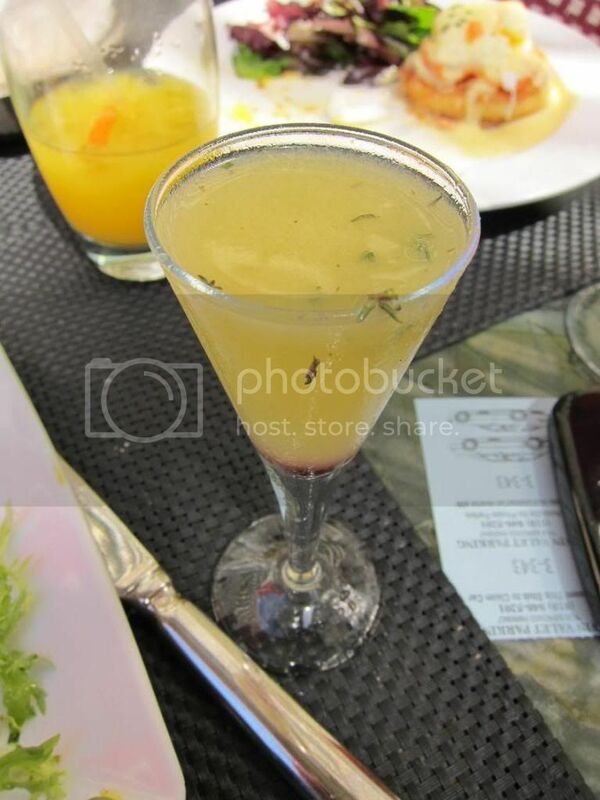 Mine was a little bitter, perhaps the combination of the herbal gin and the rosemary was a bit much for me. There's also that whole "drink OJ during brunch" habit hardwired into my brain. Some eggy bread with a sweet crust to start. 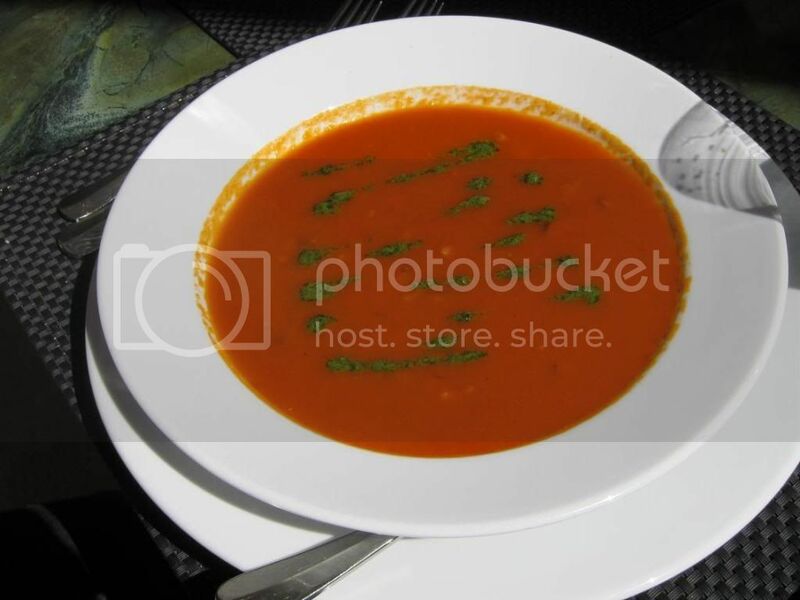 We really wanted to sit outside and enjoy the sun and breeze, but since it ended up being a rather windy day, we both started with some soups. The chunks of shiitake were very good and brought the dish up a notch. The soup had a nice smokiness (in the words of my roommate, it reminds her of when she puts bacon in tomato sauce). No lobster chunks here, but you can definitely taste the lobster. 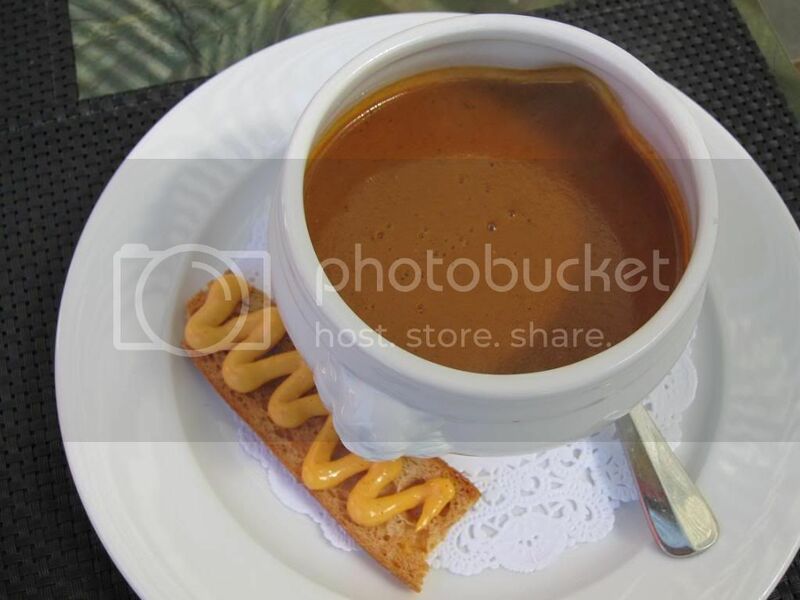 A thin but flavorful bisque. 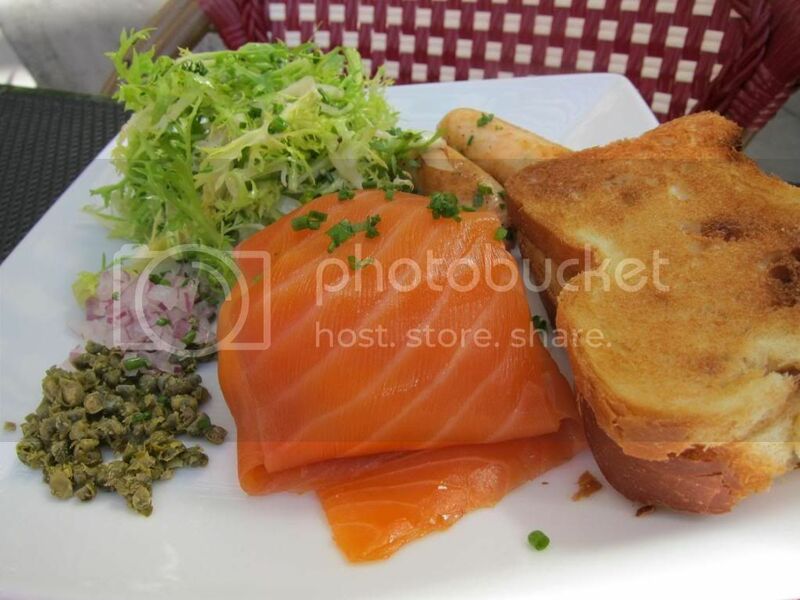 The smoked salmon used here was on the meatier side and had a good smoked flavor. 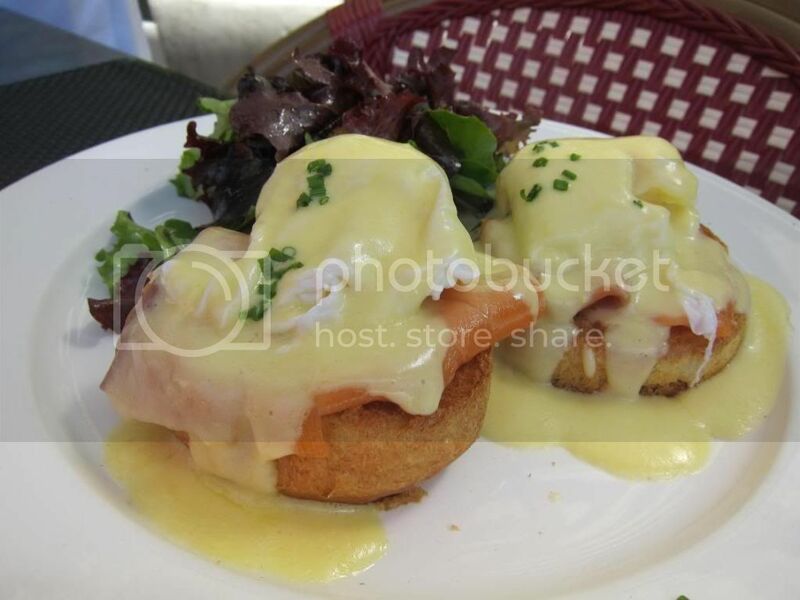 The brioche was nicely flaky and the egg was poached well - runny without being too much so. My roommate never had a croque before so that's what she ordered. Croque Monsieur on House Baked Bun with Bechamel, Swiss Cheese, Organic Ham ($14 + $2 for egg). 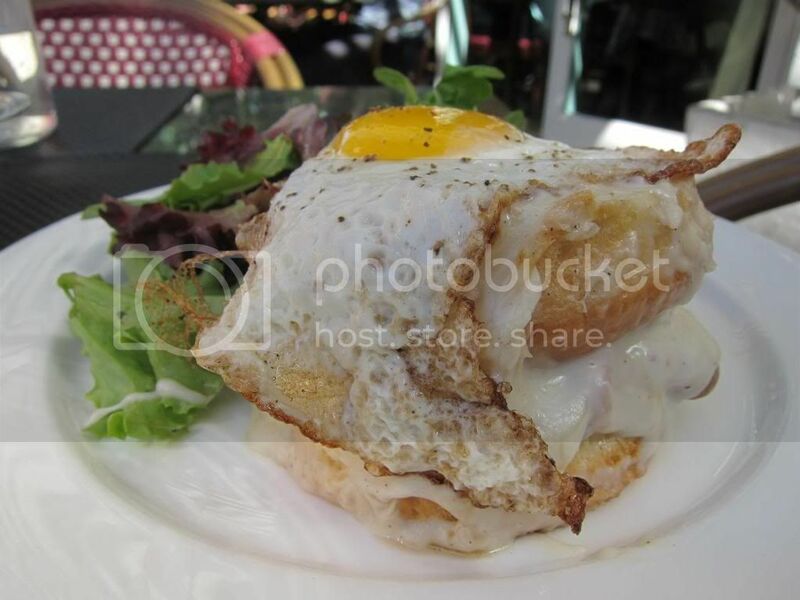 She got the egg- so technically she got a Croque Madame. I tried a bite and it was a pretty good although a heavier version of the croque, given the thicker, richer buns used in it. 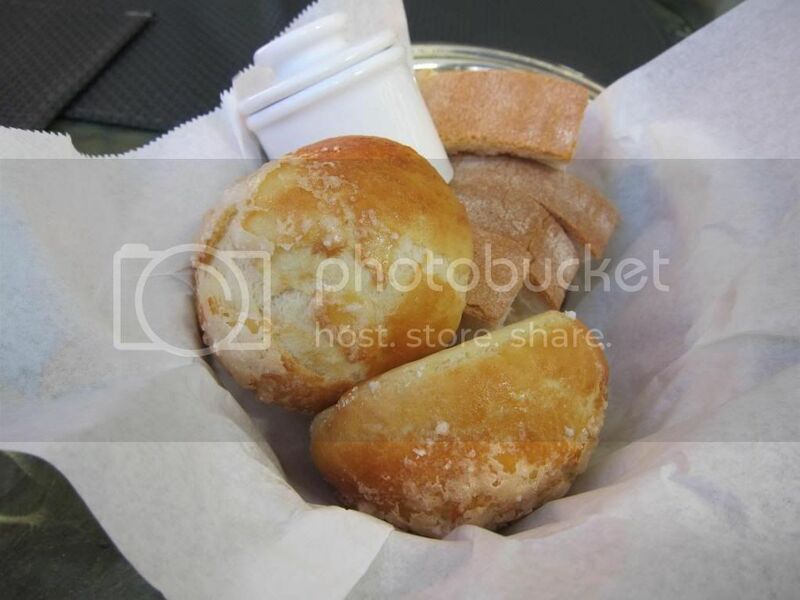 Even so the bread was pretty air so the dish was not overly dense. The ham was also smoked in house and was great. My roommate loved it and it was her favorite entree from the table. I'm glad he sent out this dish as it turned out to be my favorite. 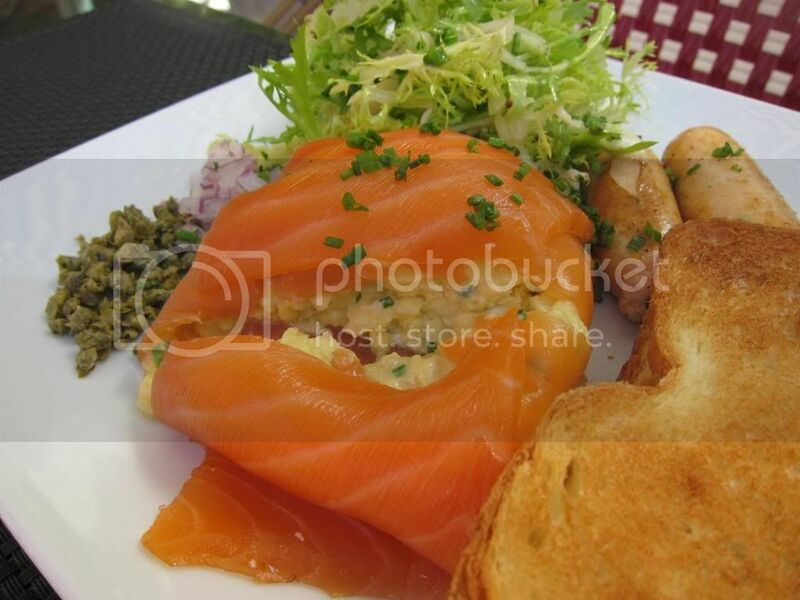 The lemony frisee complemented the salmon very well. I loved the moist and runny scrambled eggs. Most notably though was the salmon sausages made from smoked salmon, fresh salmon, and a bit of white fish. The sausages were light yet flavorful. 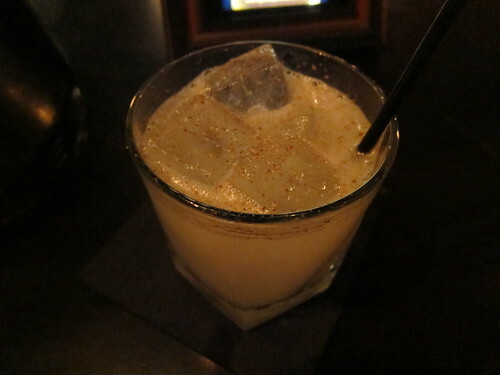 This was made with thyme, lemon, and a rather special vodka: Zubrowka, a bison grass flavored vodka from Poland. Sweet and smooth. Dangerous. 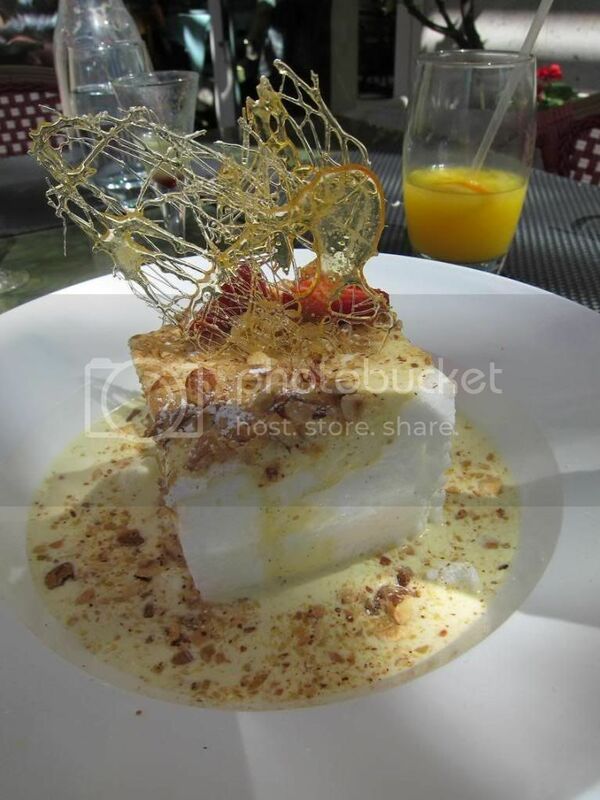 This was a fluffy meringue sitting on top of a pool of Crème anglaise and topped with pralines. We both absolutely loved the praline. 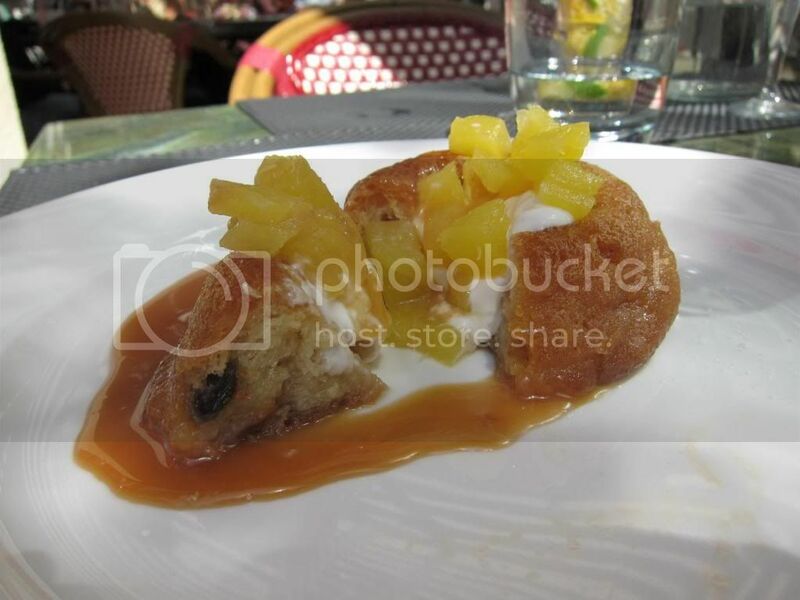 After biting into just the rum baba, we thought it was definitely a good rum baba, but it wasn't until we found out what was in the little tin jug that this dessert become amazing. No, not maple syrup. Jamaican dark rum. 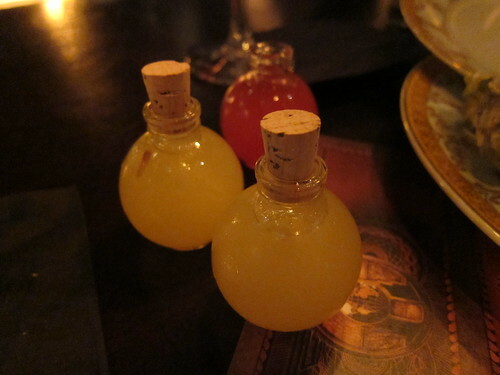 Just a spoonful of dark rum ... and a little piece of baba. Oh yes. 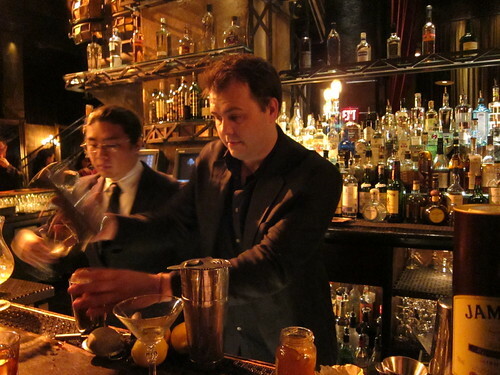 Maybe it was the overflowing libations we had but we both really enjoyed our experience here. 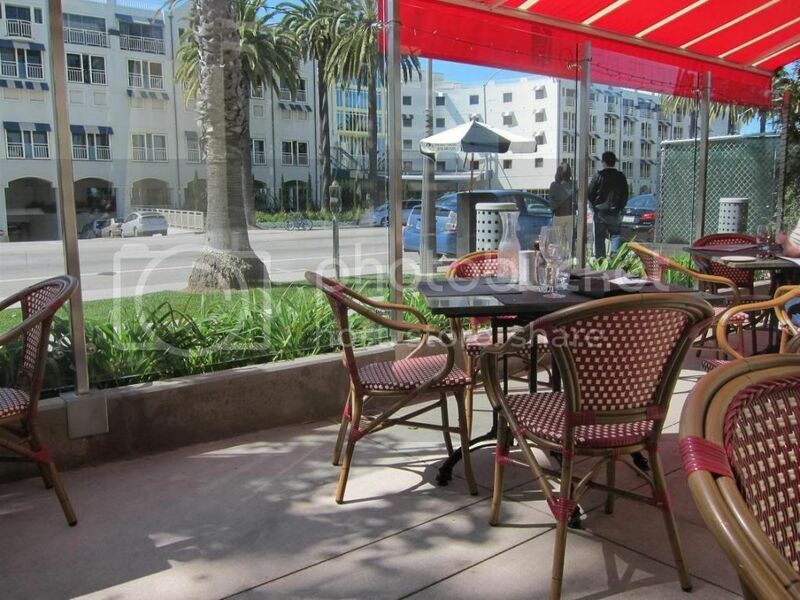 The patio had a classic French bistro look with the added bonus of So Cal sun and sea breeze. Chef Meteigner's food was good, especially the delectable house made salmon sausages, as well as their house smoked salmon and ham. Both of the classic desserts we had were more than solid. 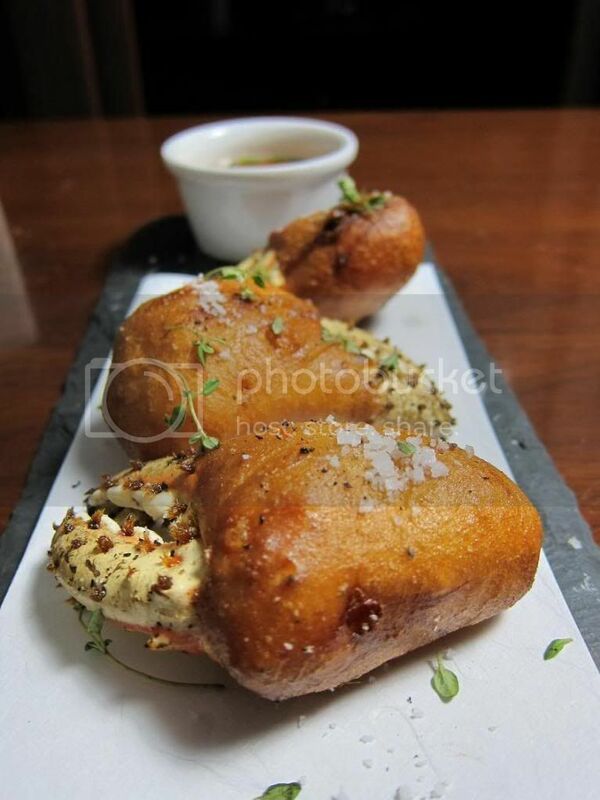 Give me some eggs, salmon sausages, and a rum-soaked baba, and I'm good. If only I can make it here during the week for their $15 three course lunches. What do you do when you get a six-pack in the mail? You bring it over to your friend's house with the big TV on a Saturday, of course! That's exactly what I did with the 6-pack of Samuel Adams Noble Pils - their new spring seasonal beer that's brewed with all five of their Noble Hop varieties. This Pilsner replaces the White Ale as Sam Adams' spring beer. We kicked back with some korean omelet rice that my friend's roommate made and watched SNL. The beer: a pale yellow/straw pour. Citrusy aroma. Crisp and light but still has a malty character. Hoppy finish - but not too bitter. Very easy to drink. Definitely a good inexpensive beer to drink with friends in front of a TV. I also thought my friends can give me some input about the beer that I can incorporate into the review. Alas, I miscalculated. "It reminds me of something. But I don't know what." Good job, guys. Good job. 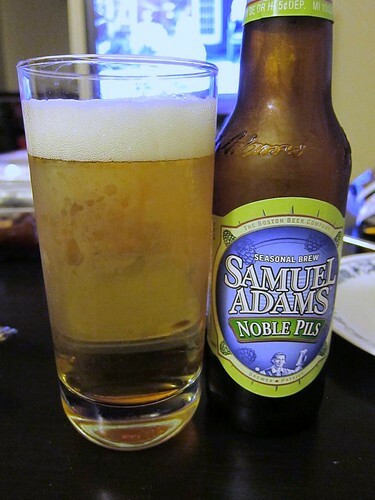 "Sam Adams' Noble Pils, brewed in time for Spring, can make for a pleasant seasonal alternative to the more mainstream beers. A first sip and you notice that the beer is not as carbonated as expected. Another sip and you realise that this allows you to taste the hops that much better. The beer has a surprisingly watery feel in the mouth, which can be a nice change from some of the 'drier' beers. Taking a look at the green colours on the label, you might think of citrus, and you'd be right - in theory that is. Whilst the blurb on the label mentions the 'lively, citrus hop character', the taste of the citrus is barely noticeable. This is a pity, as it would have made a positive contribution to the flavour of the beer, particularly given that it seems to be intended as a spring beer. However, there's plenty of taste there - the 'Noble Pils' is so-named because, as the label informs us, it was made with all five Noble hops. Whilst those accustomed to heavier lagers may not be so interested in Sam Adams' latest offer, it makes for a welcome alternative to those who are used to lighter beers and are looking to try something with a little extra taste to it." When I was invited to a dinner at Sashi in Manhattan Beach (extended thanks to Glutster), the name Makoto Okuwa was somehow familiar to me. 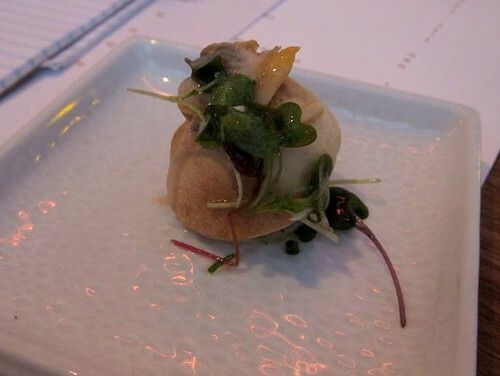 Upon hearing that he worked under Iron Chef Morimoto and was also among his crew in the TV show, I finally remembered seeing him in a cook-off against Top Chef contestant Betty Fraser at the LA Mag Food Event back in 2008. 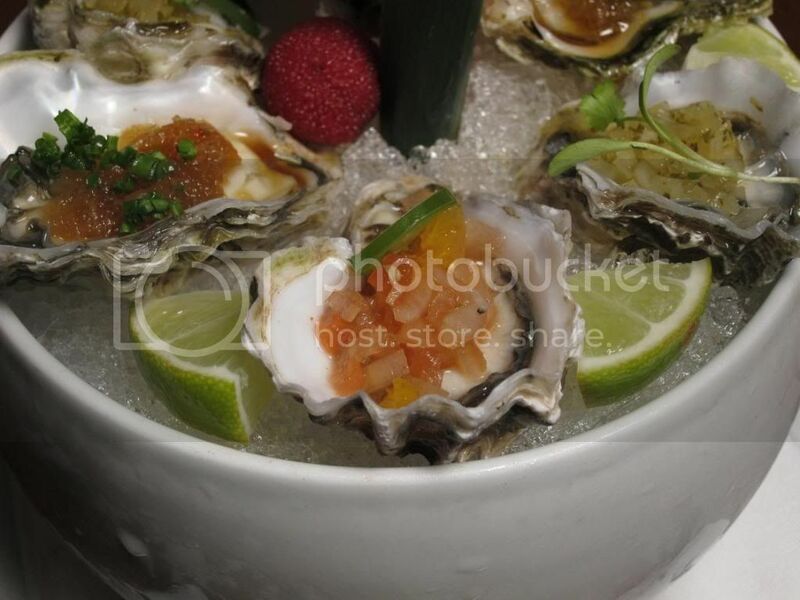 Chef Makoto Okuwa grew up in Nagoya and eventually moved to New York where he worked under Iron Chef Masaharu Morimoto. 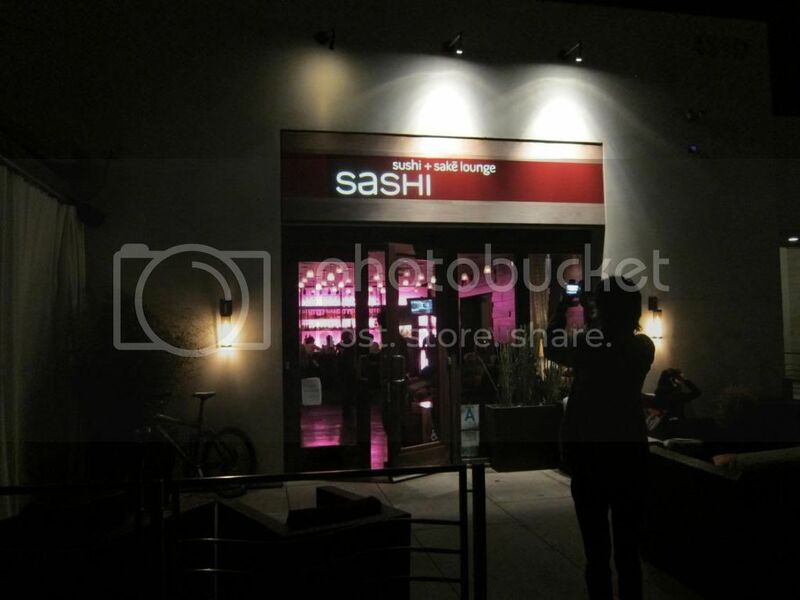 Now he has his own place in Manhattan Beach: Sashi. After Mattatouille, Glutster and I lounged on the chilly beach for a while and reminiscing about our Bali trip(the last time we were all at a beach! 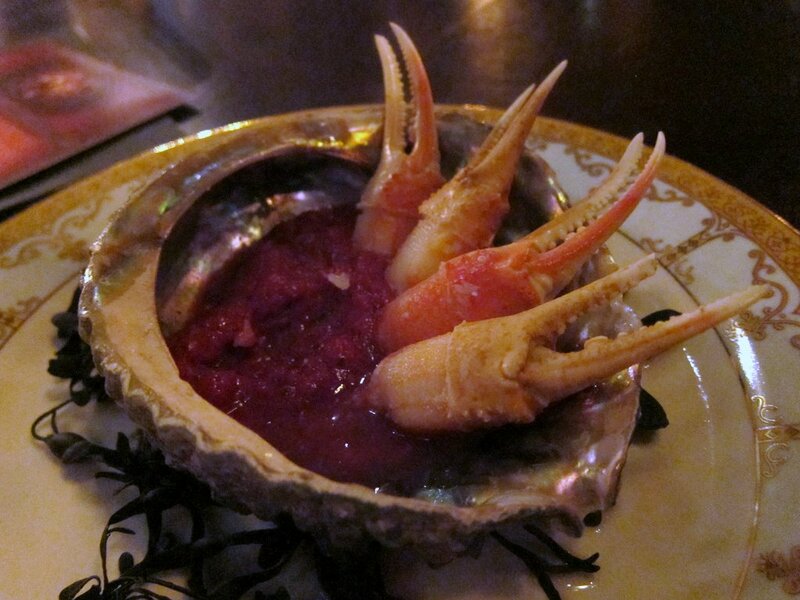 ), a family-style tasting menu at Sashi began. We were joined by Pardon My Crumbs, Kevin Eats, Sushi Lush, and Active Foodie. We had so many dishes I will not be able to go through them all here, so I will just give you about the top 80% of what we ate that night. 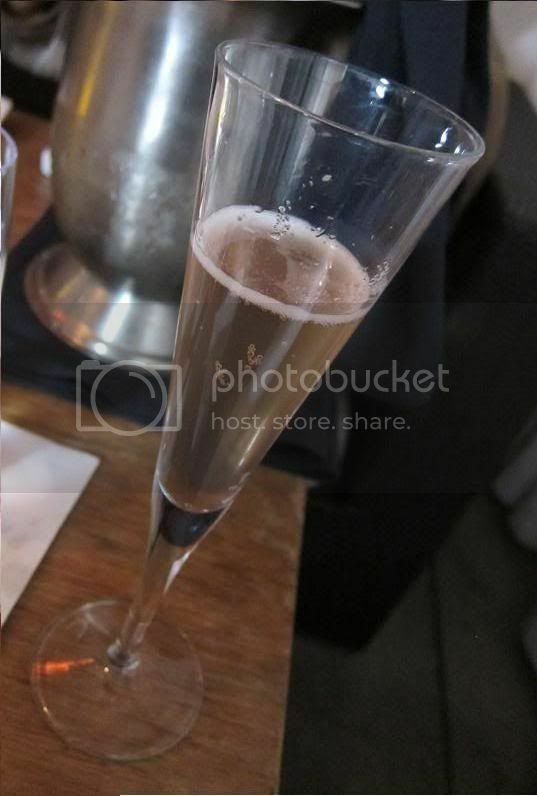 We all love to start with some bubbles. Luckily even for this japanese food/sake dinner we can still get our bubblies with the "Flower Sparkling" Hana Hou Hou Shu. A bit sweeter than champagne, but otherwise crisp and easily drinkable. I, for one, appreciated having a sparkling to start. For the amuse bouche: "New England Clam Chowder"
A playful rendition of the classic clam chowder using a small air bread (a la The Bazaar) infused with the chowder and topped with manila clams and some truffle oil. 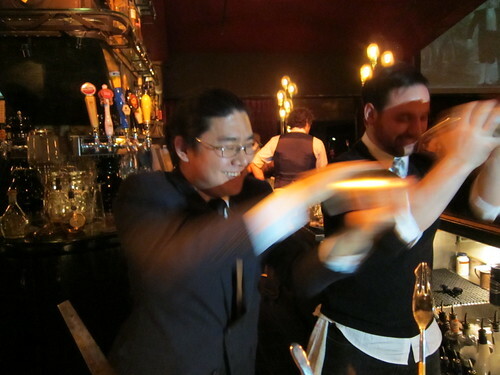 It's a nice introduction to Chef Makoto Okuwa. A simple dish, but we all liked this. 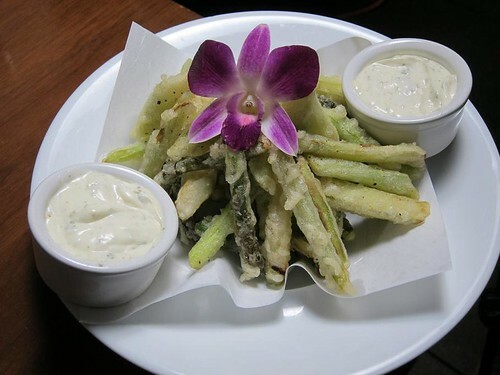 The light batter did not hide the texture and flavor of the fresh asparagus. 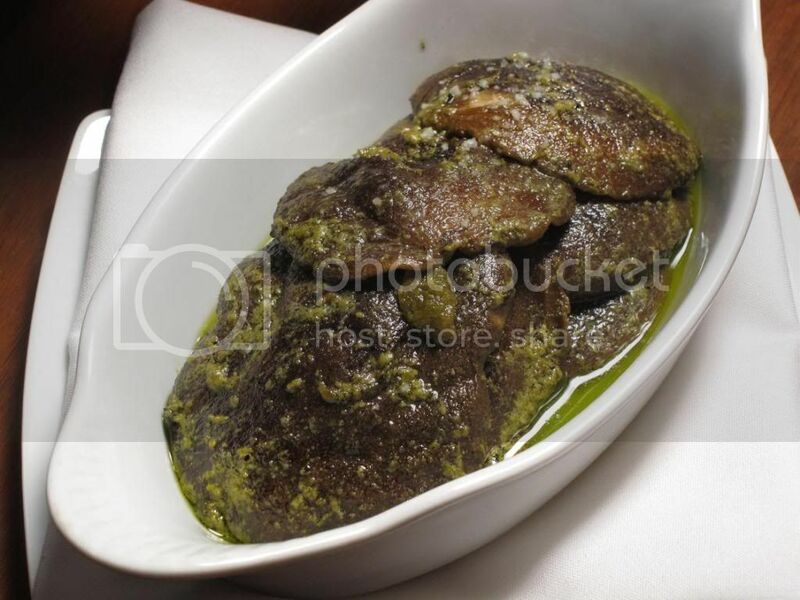 Whether such a strongly flavored dish is a good appetizer before all the oysters and sashimi I'm not sure, but that aside I love both shiitake and pesto and while I never thought of the combination of the two I decided I loved it. 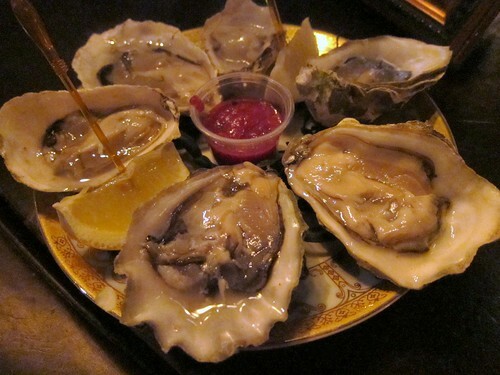 Each of the fresh oyster was dressed differently. 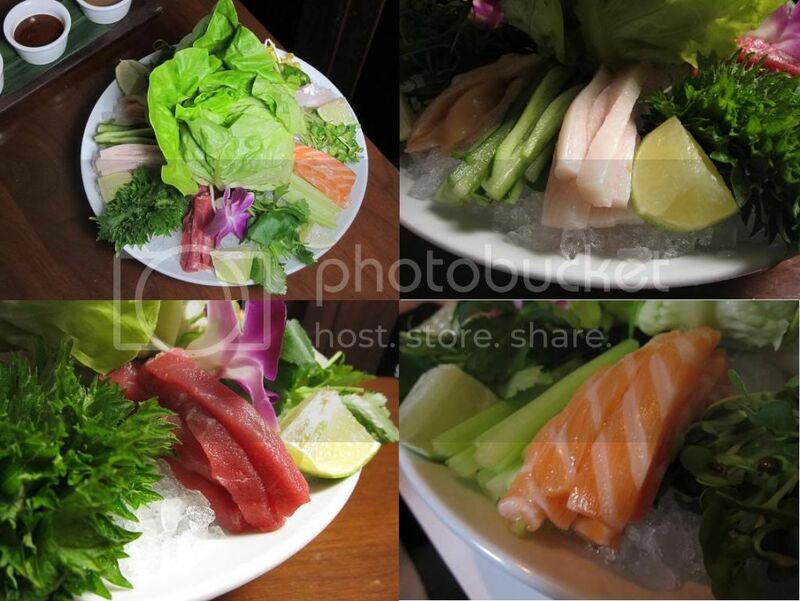 For us the 5 fish were: salmon, aoyagi, hamachi, tai, and tuna. 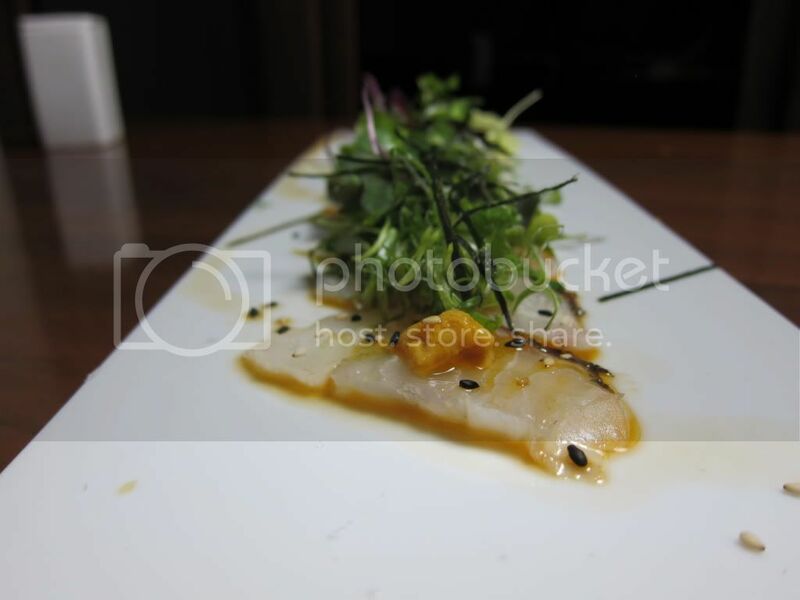 They serve very high quality sashimi here at Sashi. The lettuce wrap is supposed to be a nod to the Korean ssam wraps and surprisingly I did like the sashimi with the gojuchang sauce and the lettuce wrap, although I think I still prefer soy sauce and wasabi. 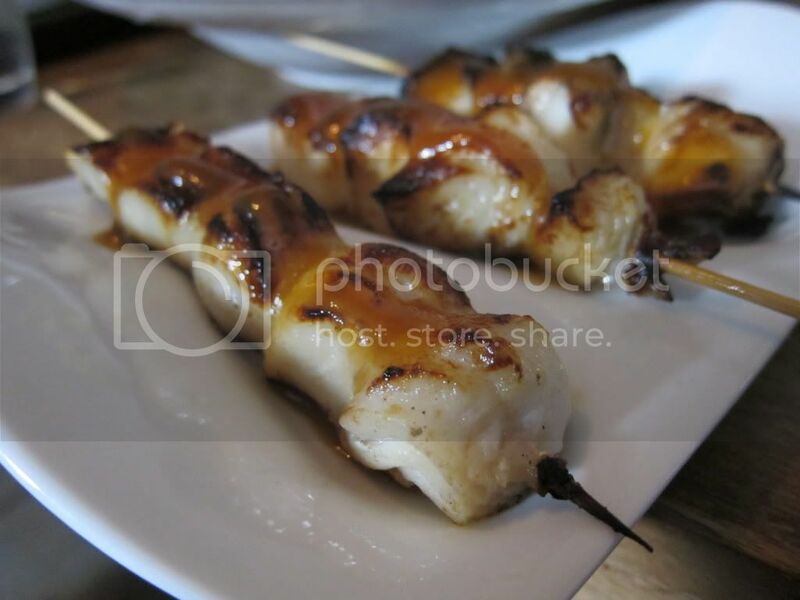 This robata take on the famous Nobu dish had a slight smokiness and nicely charred crispy bits around the edges. The rest is sweet and fall-apart tender. A fatty pork bun that was made even richer by the kewpie mayo (and I'm all about kewpie mayo). 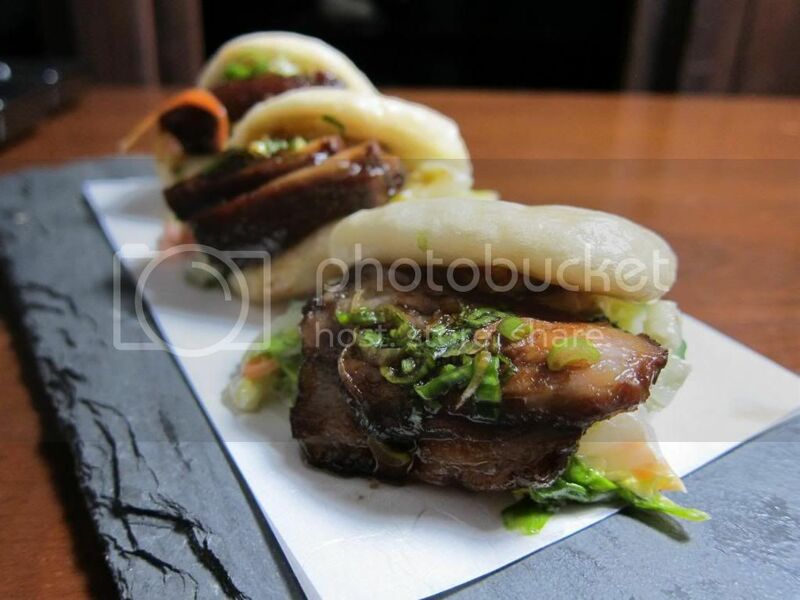 A pretty good rendition of pork steam bun that is somewhat of a combination between Momofuku's and Ippudo's. The bun is a bit thick here but overall still good. 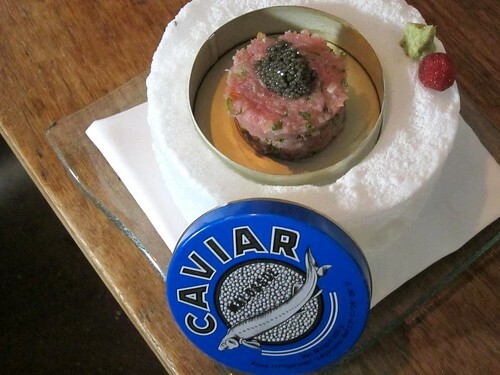 Toro with caviar? How indulgently exciting. The tartar had a good texture but the flavor was dominated mainly by the scallions. Since it was colder than I think it should've been, I couldn't taste the toro as much as I would've liked. For the Chinese in the group, this is probably reminiscent of the walnut shrimp minus the walnut. In any case, you can't go wrong with crunchy battered fresh shrimp in aioli. An interesting dish and while I liked both the batter and the crab meat, I still prefer my crab prepared simply roasted or boiled. I do believe frying dries it up a bit. These Japanese wagyu slices come with a certificate of authenticity. These amazing slices of meat are yours to cook yourself tableside. There's no way to screw this up, delicious all the way. Besides this we also had a chicken teriyaki pizza ($15). Both were fine but I can't get that excited about pizzas at a Japanese restaurant. OK so we were expecting a small tasting-size bowl, not a full-sized portion, but regardless this ramen turned out to be the night's favorite for many. And, yes sir, it was quite spicy. We finished with desserts by pastry chef Kei Hasegawa (formerly from Nobu). 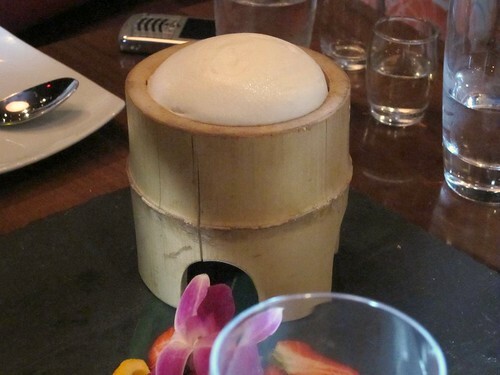 Though you can't tell from this photo, the bamboo cup held layers of the mousse, the ice cream, etc. This had a nice light tartness to it. This was also light and tart but I found that the tartness overwhelmed the berries too much for my taste. Easily my favorite dessert. 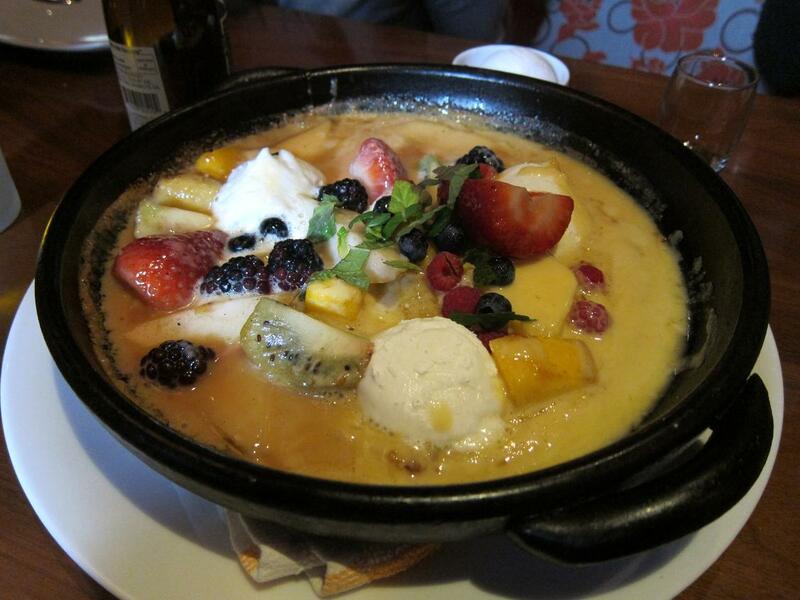 These fruits cooked in the creamy passionfruit chocolate sauce were the perfect ending for that chilly night for me. Perhaps my initial expectation was biased by the fact that I was in Manhattan Beach (though I recently had some pretty good eats there), but I was happily surprised by Chef Makoto Okuwa's food. 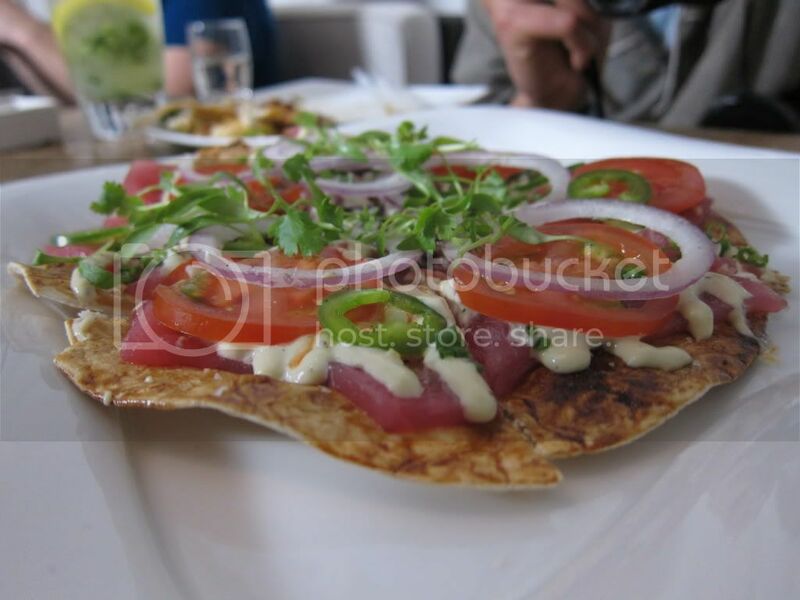 Most of the dishes are variations of familiar and popular fusion dishes, but they were well executed and he has sourced good quality ingredients. 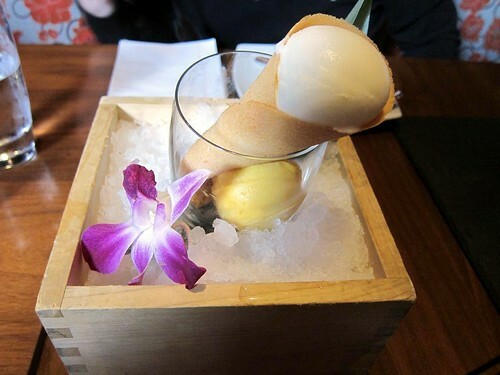 Though it would be great to see more of the chef's own personal flair on the menu as he demonstrated with the amuse bouche, Sashi provides a solid meal. And a bowl of that taiwan ramen noodle would do one well after a cool night on the beach. The best dinner of my last NYC trip? Easy. Eleven Madison Park. "Taste of Autumn" menu - $125 (yes, this was back in late November - a belated post) in a art deco dining room with magnificently high ceilings. It's quiet, it's classy. Frank Bruni gave Executive Chef Daniel Humm's food four stars before leaving NY Times, so I came with high expectations. Luckily, they were met. 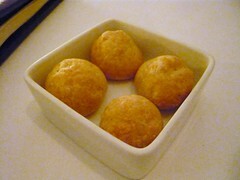 Warm gougeres to start the meal that will be marked by courteous and professional service. 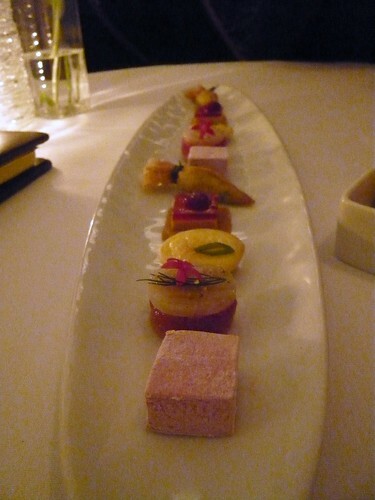 A plate of pretty and whimsical amuse bouches came immediately after: beet marshmallow, foie gras pate, fried sweetbread mini come (and another which escapes me at the moment). First impression: gorgeous. 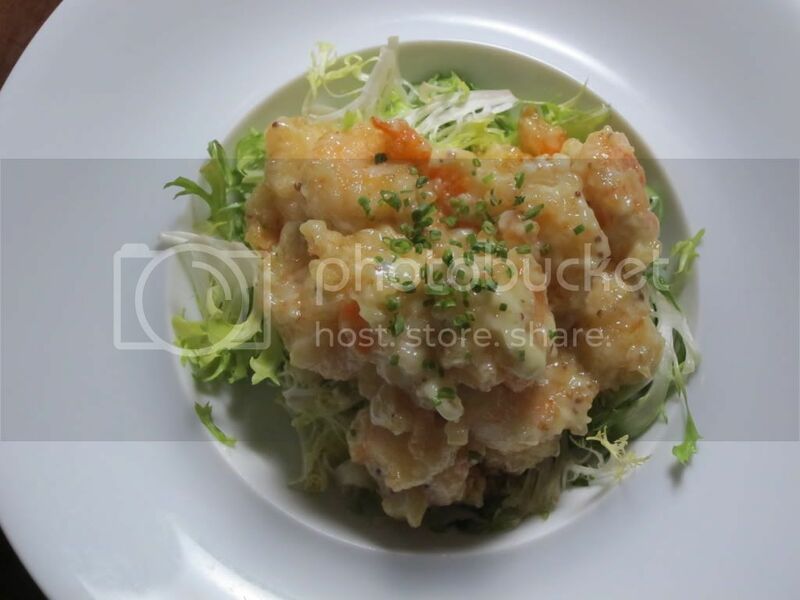 Lasting impression: a delicious play of crisp prawns and the smooth and creamy avocado, both of which were so fresh their flavors scarcely needed the yogurt. 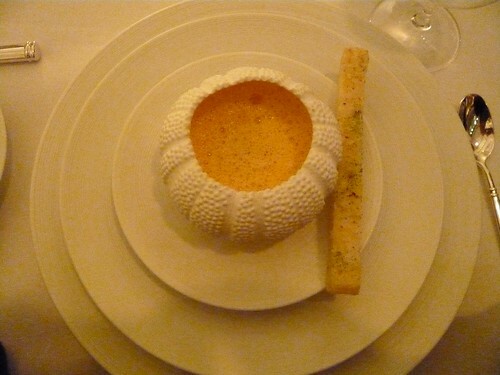 Sea urchin cappuccino with Peekytoe crab. The uni here contributed to a rich creaminess, but the flavor did not come out as strongly (to the delight of my companion, who didn't like uni all that much). Dover Sole. 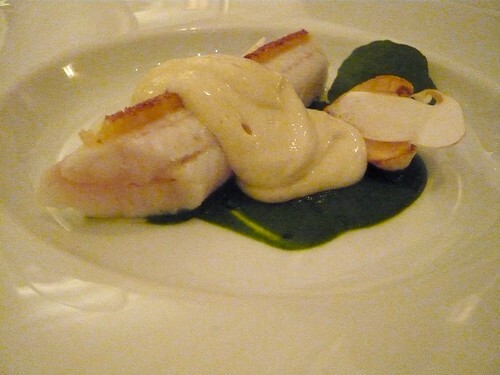 Slow cooked with Matsutake sabayon and Nasturtium. Firm yet moist and tender, the Dover Sole's texture was little overwhelmed by the creamy sabayon, but the flavors worked quite well. Four Story Hill Farm Suckling Pig Confit with spiced plum chutney, cipollini onions and cider jus. Tender confit topped with crisped crunchy skin. 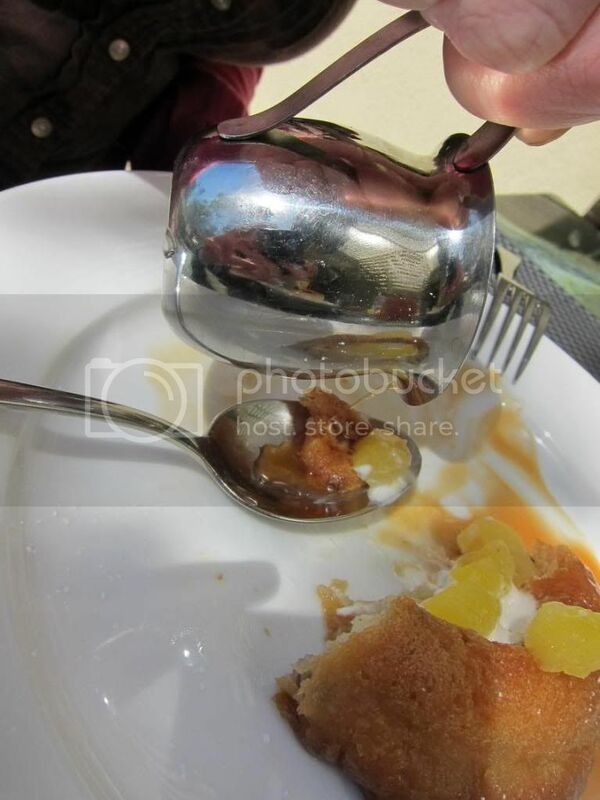 The spiced plum chutney was both interesting and had nice flavors, but was perhaps unnecessary for this confit. The combination was a bit too rich and sweet. 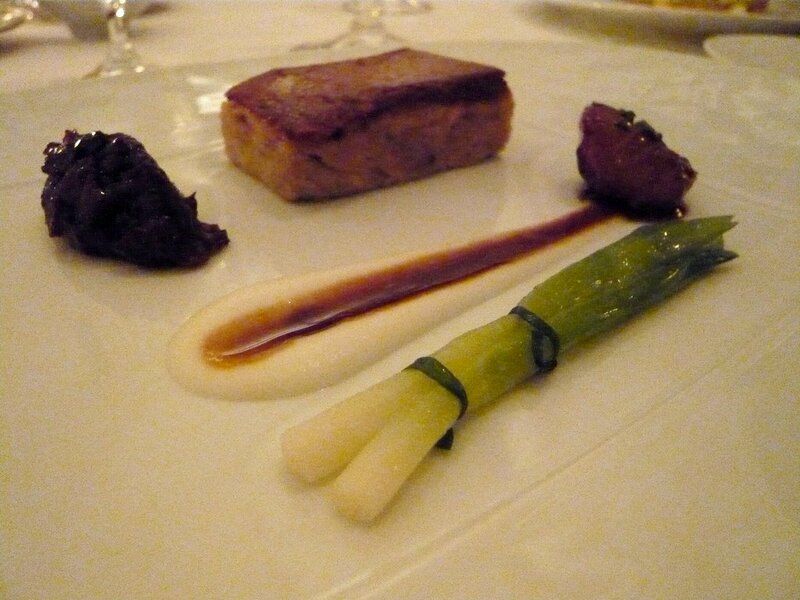 Regardless, the confit itself was excellent. 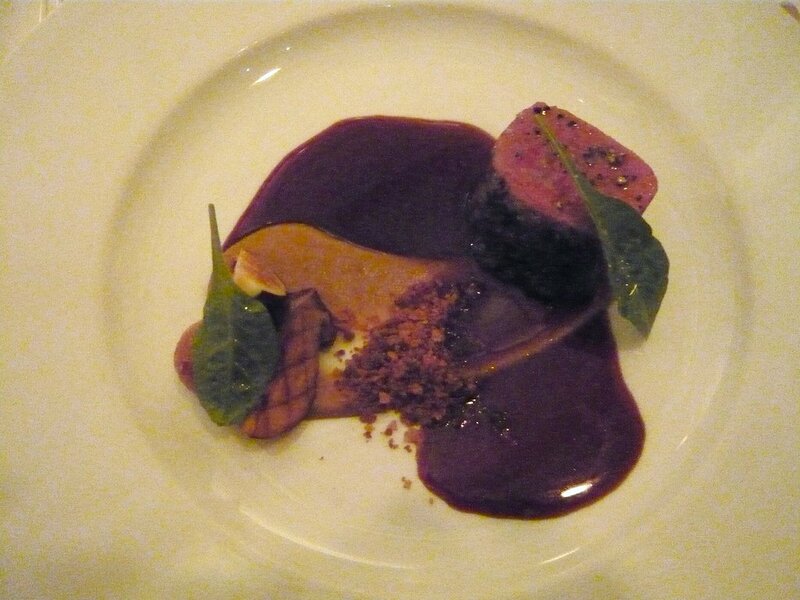 Millbrook Farms Venison, herb roasted with gingerbread puree, porcini, and black mission figs. See how pink it is in the center? Loved it. It's tender, it's almost rare, it's a little gamey, it's perfect. The venison and the figs were a winning combination. As a palate cleanser, "Kir Royale" on a ceramic pillow. 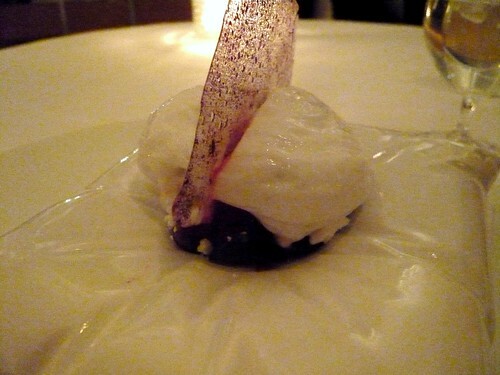 Cassis, meringue, champagne emulsion. A light palate cleanser that did its job nicely. 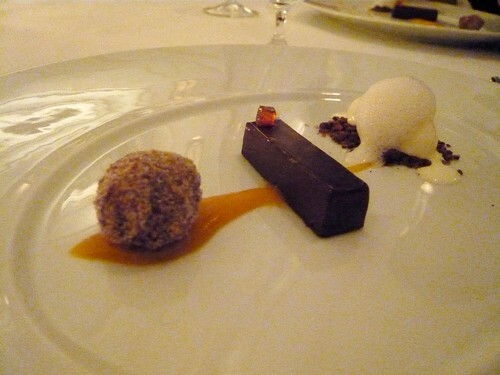 Araguani Chocolate Ganache with Sweet Potato Dauphine and Chestnut Honey. A rich and decadent Valrhona ganache will get my vote anytime, but the sweet potato dauphine was surprisingly good for me who was never all that big on sweet potato (I like it but I don't love it like many people I know). Mignardises involved macarons and chocolates. 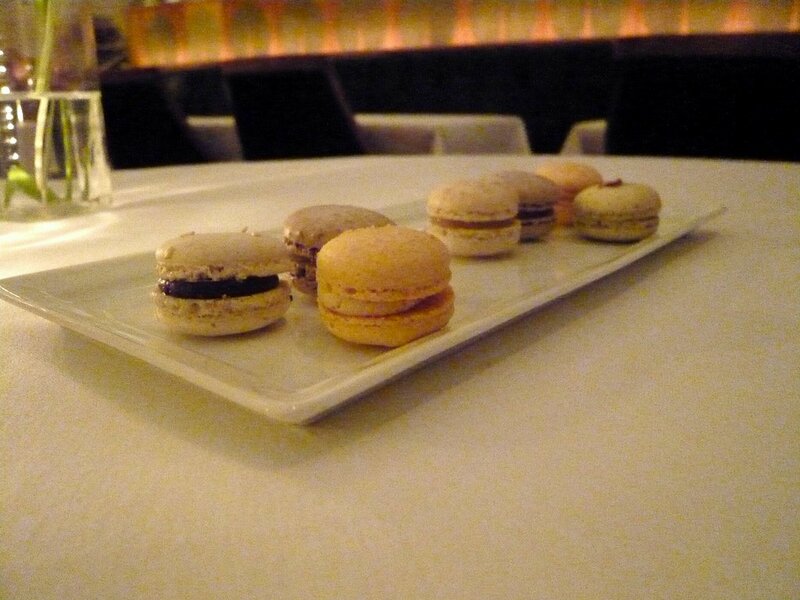 Some of the macaron flavors were almost as whimsical as the amuse bouches: violet, peanut butter and jelly, black sesame. 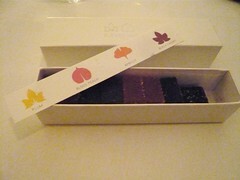 The chocolate truffles also involved me going "Ohh, hmm ..." when they asked me which flavors I wanted. A box of fruit jelly for the ladies to take home. My snack for the next two days. It wasn't just the food. It was the space, the service. After rushing around the city, I felt calm and relaxed dining here, but never were we waiting too long for the next course slightly annoyed. The food itself deserved three or four stars. One Michelin star? If you ask me I'd give them at least two.